Sweet! I will be thinking of this bird as I bake pies! Pies? Growing up, I remember my Mom spending lots of time making apple, pumpkin, and mincemeat pies for Thanksgiving. There were nine children in my family, so there were lots of pies ( and other wonderful foods). And so you should be – lovely lines and soft colors, and a lovely pose! Gorgeous photo. I love the composition and the mixture of cold and warm colours. Thanks, Laura. The scene set it itself up for me in many ways and all I had to do was capture what I was seeing. Of course, it was a little more difficult than that, but this was not one of those images where I had to work hard to achieve the output that I was looking for. Benjamin was just preparing to leave for home with his Mommy and he spied your email. He recognizes “Mr. Mike’s” posts by your name! He was ecstatic to see his favorite Orange-Bluebird and even more so when I enlarged the photo. “Look how beautiful the sky is, just like my bestest bird friend!” Indeed, I must agree! Thank-you, Mr. Mike!! Nice shot, Mike. I like the way the background colors echo the bluebird’s. Thanks, Eliza. I too saw the bluebird’s colors in the background, but I wasn’t sure if if was just my imagination. Thanks, Bonnie. 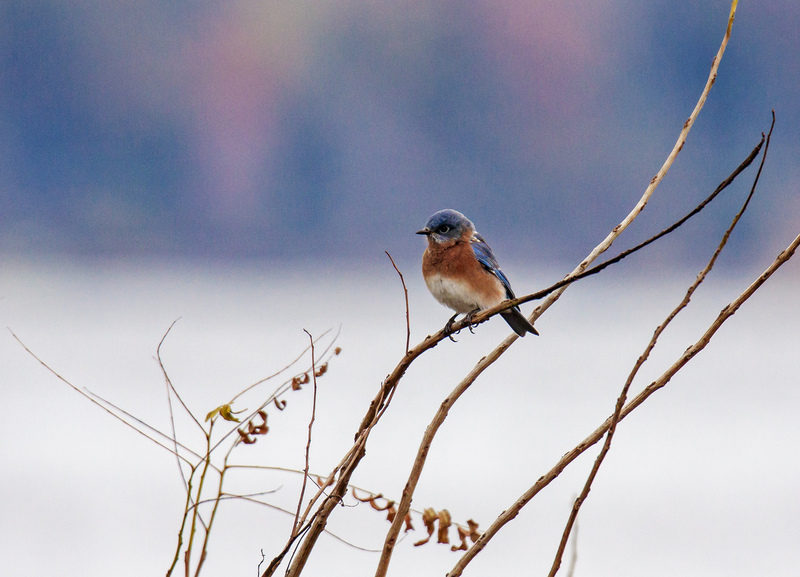 Somehow my recent bluebird shots have been among my most “artsy” images. Great capture, Mike. I’m late, so Happy Thanksgiving ! Well put, Mike, and a very nice capture of the Bluebird! It’s a lovely capture, Mike! I’m glad you didn’t get closer, it’s so nice to see the bird in its environment and the colors are stunning. A very nice autumn picture indeed!